Personally, i did enjoyed watching Disney Moive Plane to a certain extend. I like the moral of the story which is do not be afraid to think of big dreams as nothing is impossible. It does not matter how people criticise you and think that you will never make it in life, so long as you have the passion and the "NEVER GIVE UP!" attitude. The storyline is predictable and toe along moral education and dreams which is the main focus for most of the animation for children. 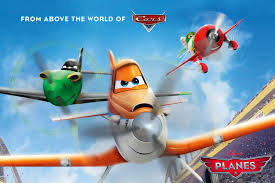 Likewise, Planes is nothing spectacular and no 'wow!" factor in the execution of the plot as the story goes. In fact, there is nothing much exciting until towards the end. The sabotage of the Dust rivals and those tricks to outwit him was quite intensified. Nonetheless, the ending is pretty much predictable. I would recommend this moive to children, especially below the age of 10 years old. To the credit of the moive, children will feel insipired to move towards their dreams. A story which talk about friendship, dreams, mentorship and a touch of romance makes the moive Plane.